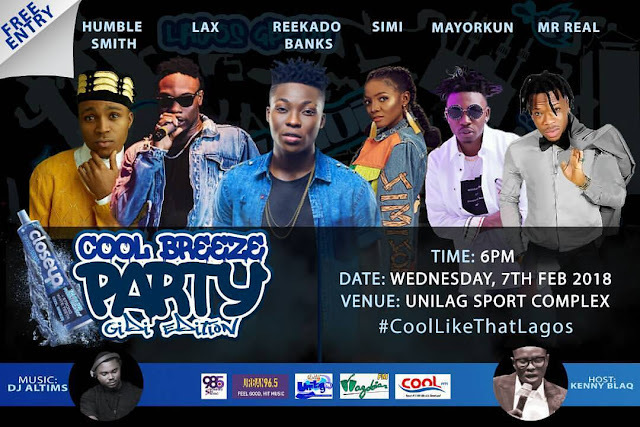 Lasgidi are you ready to be #CoolLikeThat? Come party with @reekadobanks, @symplysimi, @izzlax, @iammayorkun, @humblesmiths and @mr_realgram on the 7th of February 2018. 2 -Record your song on the beat and visit www.coollikethat.com.ng to upload your own song or upload on Instagram with #CoolLikeThatLagos. Come party with Closeup. Don't miss out. #CoolLikeThatLagos"
Shortlisted candidates will be announced by Midday, 6th of February, 2018.